As far as TARDIS’s go, there’s only a few ways fans typically make them. And that’s a big or small blue box that goes somewhere. What isn’t typical is when you’ve opened the door to go inside is to find an entire control room there. Especially not one as crazy as the one YouTuber Todd has created. It’s got so many bells and whistles that it’s hard to see all of them in a single viewing. There’s switches and knobs galore. There’s a working computer built into the panels. Heck, there’s even a flux capacitor. Which is a nice touch if I do say so myself. Of course any description I try to give really won’t do it justice, so be sure to watch the video below to see this magnificent piece of work. And we begin this week with a moment of appreciation for one man’s single-minded devotion to the TARDIS. As regular Who’s Day readers will know, quite a few Whovians have the skills required to knock up a police box, whether as a shed, or a cake, or the front of their wardrobe. 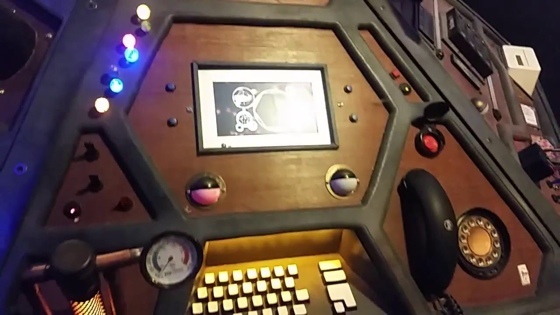 However, YouTuber The Todd deserves a round of applause, as he has spent over a year creating a TARDIS in his back garden that contains a console that actually serves as a serviceable work desk, complete with hidden keyboard, DVD-drive (and what looks like some 8-track cartridges), screen, and flux capacitor.